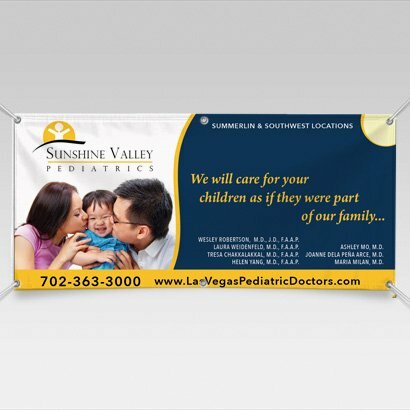 If you are looking for a Las Vegas Vinyl Banner printing company, you are in a right place. We can provide you with full color vinyl banners for indoor and outdoor application such as building signage, trade show booth backdrops, banner stands and more. Vinyl Banners communicate your message in a highly visible way. Vinyl banners are your tool to go big with your message. They can be used in a number of ways, including temporary signage, making printed announcements you want everyone passing by to see, and as start and finish lines for races. If you’re opening a new store, having a sale, or announcing an event and you want to let passersby know, use Vinyl Banners.. Our full color custom banners are made with the highest quality UV inks using the latest technology. We offer a large selection of specialty banner materials including Matte, Gloss, Artist Canvas, Eco Friendly and more. The most common order options are 8′ x 12′ on 13 oz. Matte Vinyl. Almost always, Vinyl Banners print in full color on one side (4/0) and are finished with welding and grommets every 2 feet. Do you need help designing your banner? Our team of designers can help. Call us today: (702) 233-6939. Design prices start at $30.